Travel Reviews — MumbleBee Inc MumbleBee Inc. 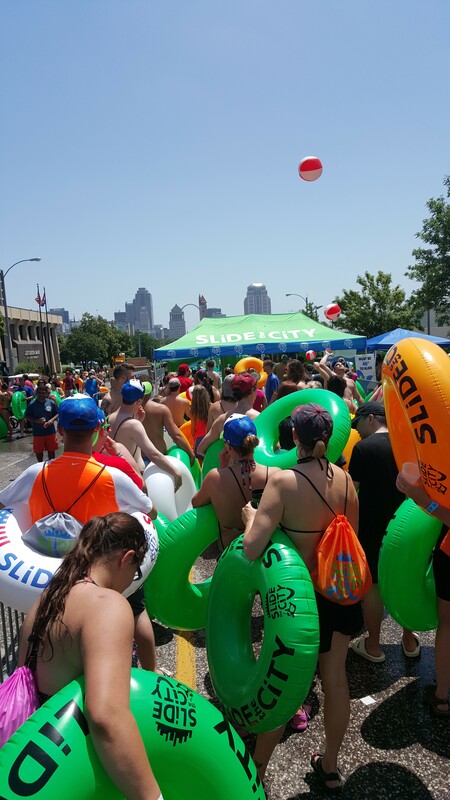 I had an amazing opportunity to travel to Saint Louis, Missouri to the event they were holding called Slide The City. You can purchase the tickets online or at the event, they offer three different choices. First one is the single slider wristband that gives you the ability to slide one time between certain time slot, a drawstring bag, tattoo, and a mouthguard. Second Choice is the triple slider wristband that gives to the ability to slide three times anytime during the day. Along with the wristband you will receive a tube, a mouthguard, tattoo, and a drawstring bag. Third option is the unlimited wristbands will be allowed to slide an hour before the slide opens and an hour after it closes. In addition to that, you’ll get a wristband that gives you the ability to slide as many times as you like during the day. You will also receive some other goodies including a mouthguard, tattoo, t-shirt, tube (we require sliding on tubes), drawstring bag and a hat. All three of these options are priced differently and depending on when you buy your tickets. I personally would recommend the unlimited slider for many of reasons. Let’s face it, it’s a water slide and nobody wants to go down a huge slide just once right? Sure sliding down three times is great, but will it be enough? NO! 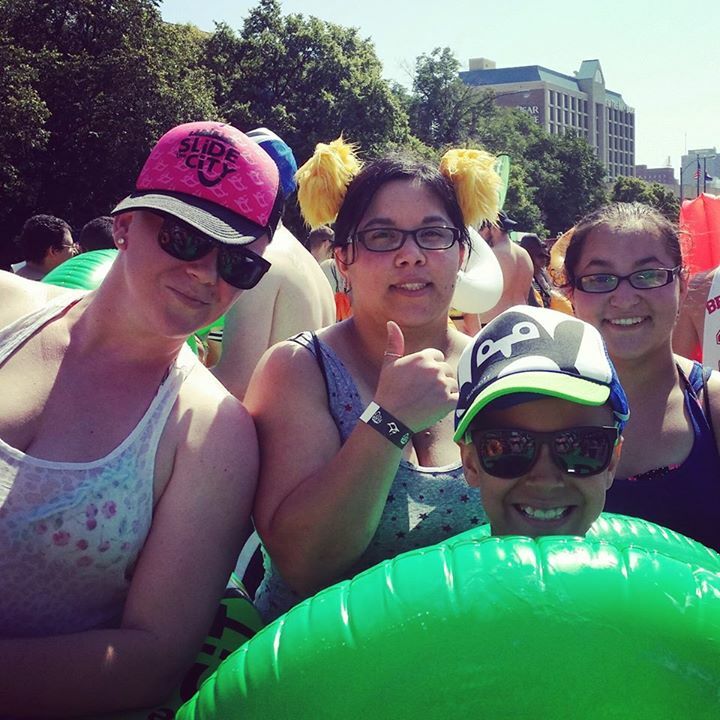 Why not make it UNLIMITED an “all day event” and enjoy the festivities around you and cool off with this 1000 feet slip and slide! Yes, 1000 feet water slide and it is BIG! We got the unlimited slider and went over a dozen times throughout our 10 hour stay. It was a hot day in Saint Louis and the lines were long, but it was worth the wait. Plus, we had a special time slot for “unlimited sliders only” at the end of the day. We could go down the slide as much as we wanted so why rush. We enjoyed a music preformed by a live band and seen a lot of vendors that were selling food and drinks. There were also some bug names out there giving away free full size samples to try such as McDonalds, Lipton and Wild Harvest® Organic. 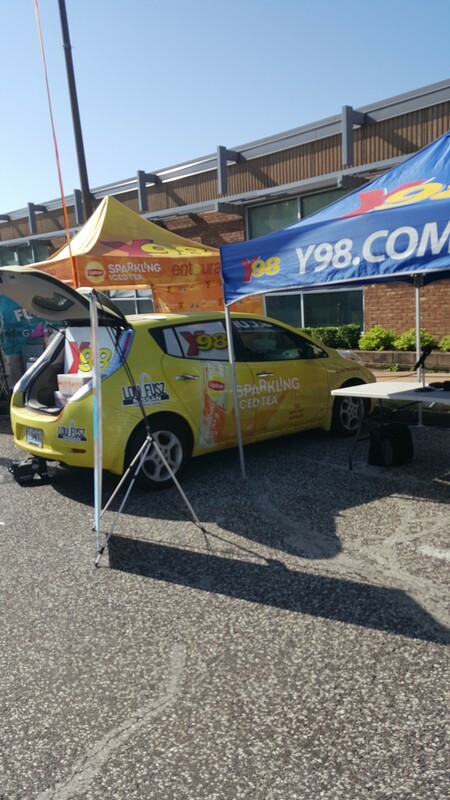 There were two radio stations there that day as well to make sure we all had a great time and was playing all the latest hits. It felt like one big party for sure and everyone seemed to be having a great time. I am sure every location will have different vendors and special activities planned out through the day. Now as for the actual sliding I thought it was fun! There were some people who couldn’t get going at first and would keep stopping and having to get back up. There were only a few bad slides and by bad I mean getting stopped by either not being on my tube properly or someone else had stopped in front of me. So, I would have to walk a bit and get a running start to continue to slide. Others and I thought there could have been a little more water provided for the slides, but it could have been to water pressure. I got several of great slide that were continues and with speed! I also wiped out a person or two because I could not stop. Luckily everyone was having a great time and they were okay with me crashing in to them and even I got taken out once by a speed racer too. Even though the lines were long and the sun beat us down and we were a “hot mess” haha. At the end of the day it was great and I would go back if they came around again. A portion of the event proceeds were went to Saint Louis Area FoodBanks. The St. Louis Area FoodBank feeds the hungry by distributing food through a network of more than 500 partner agencies and engages the community in the fight against hunger. 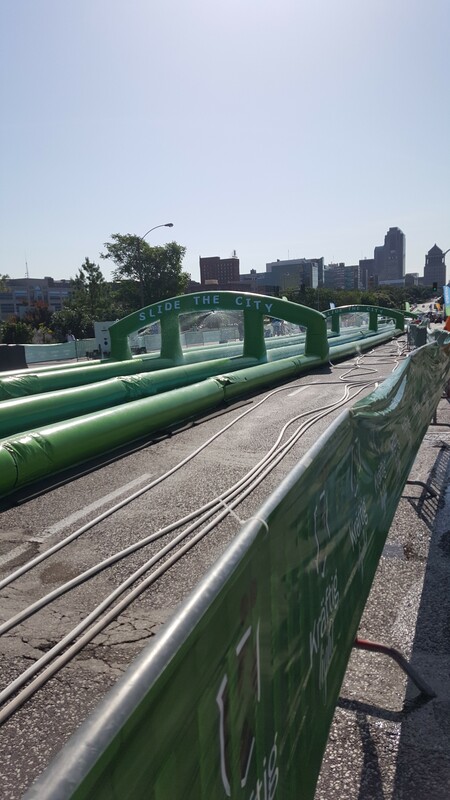 Have you ever been to a Slide The City event in your area? How was it? Comment below and let me know! Make sure to bring your water buckets, floaties, and water guns (non-realistic of course), to squirt, spray, splash, and get all attending soaked. All who are over 46 inches tall and 5 years or older are invited to slide, but remember if you’re under 18 you’ll need to get a sign off from your legal guardians. Be sure to follow Slide The City on Facebook | Twitter | Instagram to get all the latest updates on where they will be in the United States and Canada!